On Monday 11 December 2017 CMA CGM announced its completion of acquisition of Mercosul Line, one of the leading carriers in Brazil�s domestic container shipping market. 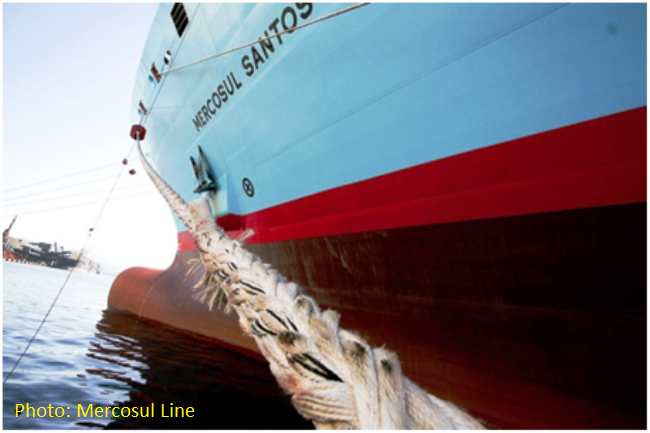 It had announced its intention to acquire Mercosul Line from Danish rival Maersk back in June. The sale was subject to regulatory approval and contingent on the closing of Maersk�s acquisition of Hamburg S�d, which it completed earlier this month. It says the acquisition will allow the group to strengthen its service offering in Brazil, and more broadly in South America, especially in cabotage and �door-to-door� services..
MERCOSUL Line was established in 1996 and currently serves more than 12 ports with a fleet of four 2,500 TEUs containerships. The company�s network includes 130 people in its offices in Santos, S�o Paulo, Manaus, Recife and Itajai. �The activity of MERCOSUL Line is part of CMA CGM�s core strategy, which is to develop intra-regional sea transportation links and complementary services such as logistics,� CMA CGM said in a statement Monday. With 18 dedicated offices in Argentina, Brazil, Paraguay and Uruguay, CMA CGM Group employs approximately 340 staff members in the East Coast of South America and operates more than 71 vessels on 9 different services and call 20 ports.